Should CurrentPrincipal carry across async+await method calls? /// Primary thread method for a lemming. /// Async method for marching a single lemming step. /// Identity for custom principal. 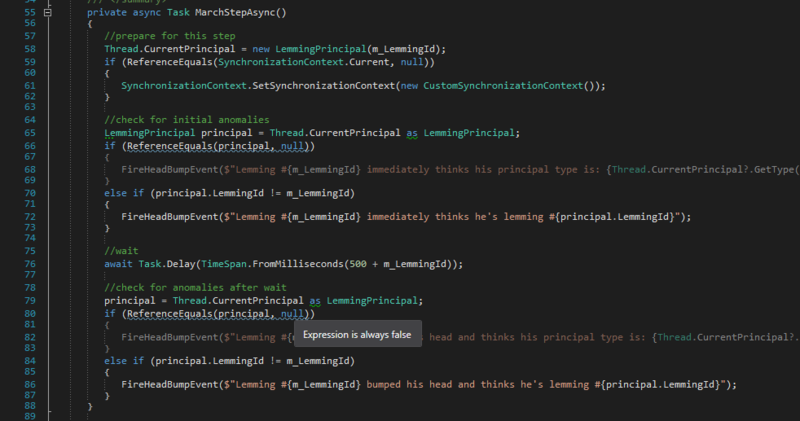 Basically, it runs "lemming" threads which repeatedly set up a custom Thread.CurrentPrincipal, await Task.Delay, and then check the principal after the await. On windows, it runs fine with no problems found; each lemming thread's logical thread of execution keeps its principal just fine for minutes on end. Is my expectation of CurrentPrincipal incorrect and the windows case is just working by happenstance? Or is this another xamarin/mono bug? If I was storing principal in my own field, I would probably use AsyncLocal to enable it to flow accross Async boundaries. I am not sure whether Windows has special casing to handle Thread.CurrentPriniciple that perhaps mono doesn't have - but that sounds like what you are describing is the case.. I found that if my [CustomPrincipal] wasn't Serializable, it would silently be lost (i.e wouldn't flow) - I wouldn't see any exception. So that's one thing to check perhaps.